Okay, I wimped out in the end. 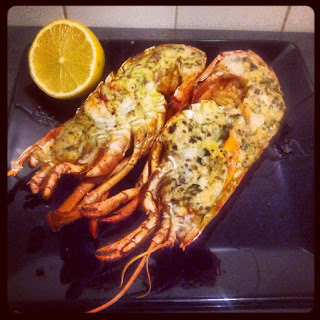 I just wasn't brave enough to buy myself a real, live lobster and so ended up with a pre-cooked one instead. 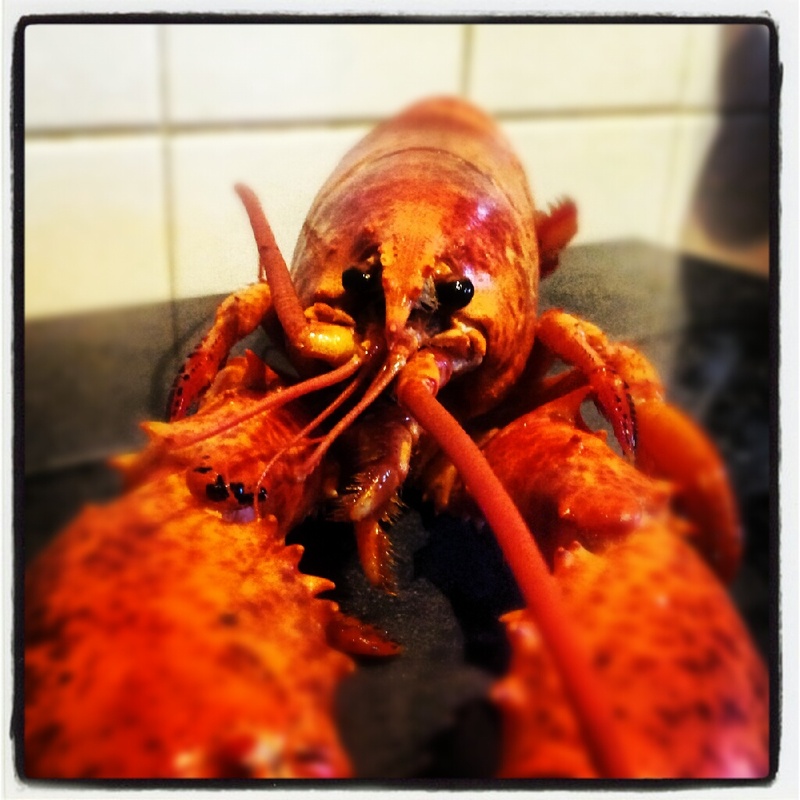 In my defence, living a fair distance from a decent fishing port means that live lobsters are hard to come by. Some research on the t'internet revealed a fishmonger on a farm shop some forty miles from here. As I was only cooking this for me, I really couldn't justify the petrol and expense of a huge, live lobster. At least that's my story and I'm sticking to it. I've mentioned before how I'm a bit of a wuss and if I had to kill my own food, I'd be a confirmed vegetarian before you could say 'peanut butter on celery'. Had I gotten my hands on a live lobster, I most certainly would've been tempted to be like Homer Simpson and turn it into a pet. That particular Simpsons episode evoked memories of a holiday on the Isle of Wight with friends of my mother. I was probably about five or six at the time and they drove an estate car which back then, we kids just used to ride in the boot of. That particular summer, we got to share the boot with the world's most ginormous live lobster. I swear blind that it lived in the boot of that car for most of the two weeks of our holiday. I don't know why it was there or what was meant to happen to it but it definitely happened as there's a picture of us all sat in the back of the boot somewhere at my mum's house. Anyhoo, having avoided the need to choose between stabbing the poor thing through the head or flinging it into a pot of boiling water, I turned to Dame Mary for advice on how to cut and clean the lobster. There are a squillion and one online guides on how to do this, but the trusty 'Know How' section in Mary's Complete Cookery Book (the original one, not the re-released one Amazon now peddle) has a step-by-step pictorial and I just knew that I'd be safe with Mary at the helm. One downside of having a cooked lobster was that the husband failed to be terrorised by it. He's a bigger wuss than I am and will not remove spiders or moths from bedrooms nor will he collect seaweed with Miss A at the seaside. On the other hand, Miss A wanted to play with pinchy and had a full on meltdown as I tried to explain that he was for tea. It's lobster, not mini octopusses. Or octopi?? I now also know that I wouldn't ever want to get into a fight with a lobster. It was pretty easy to knife through the shell but ouchy - those claws have got some nasty sharp bits on the outside when you're trying to extract the lovely claw meat. I'd originally intended to serve it with Thomasina Miers' pumpkin mole but forgot the coriander (next time I see langoustines, I'm so doing that recipe) so I went for thermidor butter instead. Next problem was assuming it was possibly to change a nappy in the time it would take for the wine to reduce from 150ml to not much at all. Wrong. Burnt shallots do not taste good. Nor do shallots burnt in white wine that has been open for several weeks. Oops. Did I mention I rarely drink? I got there in the end. I must say the mustard was slightly overpowering - but that may have been just the brand that I had (Waitrose own) or that I used a little too much. Other than that, it was a really simple recipe and should I ever find myself cooking a meal for another lobster lover, it's great because you can prep both the butter and lobster well in advance of serving. Chances of that are probably less than zero but hey - you never know what life may bring you.